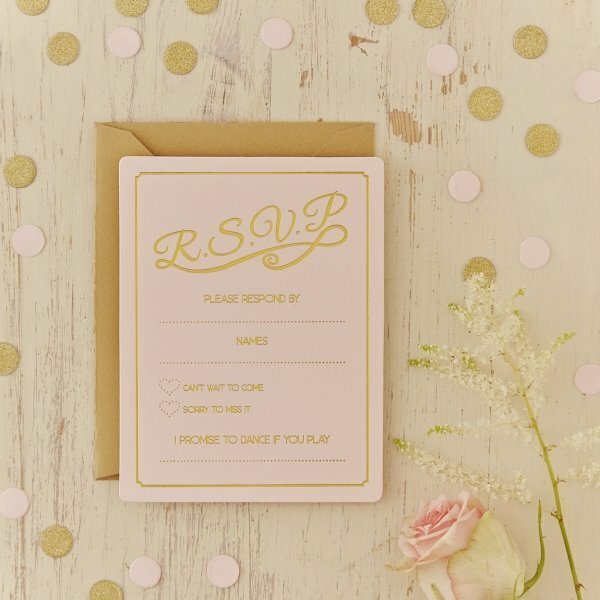 Ensure you know which guest will be attending your wedding day with these stunning pale pink and gold foiled wedding RSVP cards. Perfect for the fabulous trend of pale pink and gold themed weddings. These cards have room for your guests to fill our the information required. Cards come complete with gold envelopes. 10 x invitations & 10 cards per pack. Matching wedding invitations & save the date cards are also available. Size: 10 cm wide x 12.9 cm high.